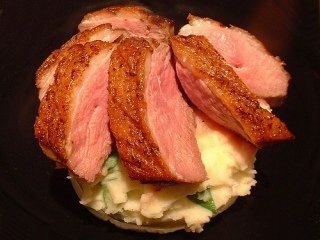 Cooking duck isn’t hard, although there are many hunters who have given up on ducks after one season of dry, inedible hockey pucks on their dinner plate. The wife and kids won’t touch it, and they don’t want theirs either. Some hunters get around this by piling up all of their waterfowl and having pepperoni made at the end of the season. There is nothing wrong with duckoroni, however hunters who settle for this solution miss out on the most satisfying part of duck hunting. Duck, cooked well, is presentable to the finest of dinner guests. In order to cook duck and love it you have to know the meat. Duck has very little fat, thus it dries out very quickly. Cooking duck like you cook well marbled beef will guarantee you will be eating alone. Here are the tricks for cooking amazing waterfowl. 1. Don’t shoot mergansers. There is a reason some ducks are referred to as trash ducks. 2. Soak in salt water or milk for 12 hours to draw out the blood and remove the “liver taste” from duck meat. 3. Two no fail duck marinades are regular Italian salad dressing and raspberry vinaigrette salad dressing, soak for 6-18 hours. 4. Braise your meat at 475 degrees for 5 minutes to seal in moisture, turn down the oven or bbq to 300 degrees and cook until medium rare. 5. Never bake or bbq duck past medium rare!! This is all about keeping the meat moist and edible. 6. Serve while hot and enjoy. If you like liver Pate’ try this with duck. Cube and boil 2-3 mallard breasts or an equivalent amount of smaller puddle ducks. Boil cubed ducks until cooked through. Add 4 garlic cloves, salt pepper and a large spoon of mayonnaise. Blend ingredients in food processor until thoroughly blended.